Disclaimer: This article contains an honest review based on some knowledge and personal experience. We are not in any way, being paid to advertise the products mentioned herein. Camping trips are a lot of fun, aren’t they? There are times when you go for extended periods and you don’t want to worry about a lot of things, at least for that moment. You’re on vacation mode after all. So the last thing you would like to think of is where to dump – your dump. Almost all RVs nowadays have the modern conveniences that are usually confined in your home such as a kitchen sink, a shower, a bed, a fridge, and a toilet. But when it comes to RV living, sizes are significantly reduced to make it all happen in a limited space. That includes a small waste tank, the contents of which you need to dispose of via a sewer dumping ground. The truth of the matter is, such facilities may not exist, especially in locations deep in the mountains, or wilderness, where campers like you would like to explore. This is why the RV portable holding tank is such a thoughtful invention. It is a wheeled container for waste water, which can be emptied much later in any dump station. These holding tanks have either a two-wheel or a four-wheel model. The former has those two wheels on the rear side. This means, when this black and grey tank is at full capacity, you may have to resort to dragging it using the two wheels while lifting it with the front portion like you would a bag stroller. When dumping its contents, it usually has to stand on end to completely dispose of its content, so, umm, you get the picture. You will also feel its heaviness in this position. On the other hand, a four-wheeled waste tank has the added comfort of extra two wheels. Thus, you will no longer have to lift it when you are about to dump the waste material in a sewer, which as I have mentioned, can be very heavy especially when it’s full. So, what’s the point of having two wheels when life could be so much easier with a four-wheeled waste tank? There’s the price of course. Two-wheeled tanks cost less to purchase, but there are definitely tradeoffs. It makes it physically difficult to lug to the sewer and back to your rig. Based on experience, I would suggest going extra when it comes to a portable holding tank and get the four-wheeled unit. Save yourself some trouble (and back pain) and I tell you, it’s definitely worth it. The best tanks also attach easily to your camper or tow vehicle, driving your way to the sewer station for emptying. They come in different sizes and capacities. They are usually made of polypropylene and polyethylene plastic, making it heavy duty and durable so you won’t be needing a replacement for quite some time. There are a number of good brands out there, and I have chosen 3 products that I consider the best in their respective categories. 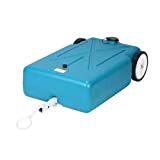 Before I delve further into my top picks, I know that for those of you who are RV experts, you might be wondering why a popular portable waste tank such as the Thetford SmartTote, was not included. This device has been in use for a long time now and was recently succeeded with its supposed updated version, which is the SmartTote 2. The OG model has had much favorable feedback from buyers but is no longer available for purchase at this time, perhaps to give way to its newer model. Unfortunately, SmartTote 2 does not cut the mustard. It has been peppered with negative reviews since its release. Its handle is said to be easily broken during its first few uses, among other parts that also seem to have inferior quality themselves. There are even more design flaws in this model. Even with the four wheels, the front ones seem pretty useless and only run on smooth concrete. The handle also comes off when it is hooked up with a trailer hitch. Worse, the hose detaches from the dump valve when in use, which can be pretty terrifying. And because of these aforementioned findings that the Thetford SmartTote did not make it to my top list. Let’s get right into it, I present to you the top portable holding tanks, one of which you may consider for your RV. With any of these choices, no more messy affairs to deal with. And nothing will stop you anymore whenever nature calls. This US-made portable waste tank from Barker Manufacturing is the best of them all. It is made of polyethylene, making it highly durable and dependable. It comes with premium features that simplify an otherwise unpleasant task of dumping waste material in the sewer. The Barker 4-Wheel Tote-Along has large air-filled tires for most of its sizes, which make it an ideal tool to roll along even on rough surfaces. This way you don’t need to bring your whole rig to the sewer stop, making a rather unpleasant task just a bit much easier. This product has a 16-gallon capacity and the only option that lugs on hard rubber tires. If you need a bigger size, no problem. It also comes in 25 and 32 gallons, with the 42-gallon tank as its biggest variant. Feeling frustrated every time you use your two unstable wheels? You won’t feel that way with this portable tank given its 4-wheel design, that can make handling a lot easier than having just two wheels. It even connects to axles with ball bearings and grease attachments that guarantee its longevity. Another thing you do not want from having just the two-wheeled tank is the fact that it entails being lifted vertically any time you will tow it and empty out its contents. This makes it all the more cumbersome for the user, especially if it’s filled to the brim. With this Barker tank, you simply tow it to the sewer and open the valve to eject the contents, without having to tilt the tank, whatsoever, and you’re done. The Barker 4-Wheel has a waste valve with a diameter of 3 inches, which is identical to that of a trailer’s, makes for easy handling and utmost convenience. The tank indicator is an important feature that lets you know when it’s time to unload its contents. There are also the bonus accessories which include a bayonet cap, a sewer hose, a hose adapter, hose clamps, a water hose, and a tow handle. Furthermore, it has a warranty for 2 years. Given the useful features of the Barker 4-Wheel Tote-Along, it has an equivalent price that is higher than other brands. However, it is justifiable and in my opinion, this is worth investing in, especially if you’re an avid RV adventurist. It’s perfectly fine to opt for a two-wheel portable holding tank if you are budget-conscious. And the best there is would still come from the same company that manufactures our top overall pick. Commonly referred to as the blue boy, the Barker Original might appeal to your needs. This product has four sizes, 10 gallons being the smallest, and 30 gallons the largest. This is a two-wheeled tank, and considering that you need to lift it when handling, picking out the smallest size would be best. Also, this will work if you don’t use your RV as much. Otherwise, you will be better off with a four-wheeled tank. The Barker Original Tote-along is made with polyethylene material with larger durable wheels. It also comes with portable tank accessories just like its four-wheeled sibling. The tank gauge may not come with the package, but you can purchase it as an add-on. As the case for a two-wheeled tank usually is, this product is no different in terms of its cumbersome handling when towing it and dumping its contents in the sewer. Perhaps the back pain you’ll get from carrying it is just not worth it. While the Barker Original may have larger wheels than its two-wheeled counterparts, its wheels are quite thin and can only be dragged properly on smooth concrete. I used to have this type of portable holding tank for my trailer. I guess I didn’t know better back then. Anyway, one time, I decided to visit my grandparents’ home, which took me three days on the road. When I finally got to their place, of course, I had to deal with my waste. I took out my portable tank which was almost full, aka, heavy. I had to tow it on its two wheels one hundred feet towards the septic tank. It may not be that far of a distance, but when you’re talking about hauling a 20-gallon tank across, it can be a pain. To think I’m only in my early thirties and I’d like to believe that I’m in good shape. Yes, it is inconvenient o support the bulky tank with your hands as you drag it. Not to mention, its skinny wheels would sink into the ground along the way, adding more hassle to an already cumbersome task. Reaching the sewer spot, my arduous chore did not end there. That’s because I had to hold the tank upright such that it will stand on its two wheels. Only then will it be able to dispose of all that’s inside. And I did say the tank was almost full at 20 gallons, didn’t I? That is why I want anyone who’s contemplating on getting a holding tank for his RV, to get the pricey Barker four-wheeled tank so that you won’t have to contend with frequent back pains, especially if you use your RV a lot. This is a portable holding tank that has the added advantage of four wheels at a cost that your wallet will prefer. Just like our top pick, the 4-Wheel Tote-N-Stor does not require tilting or lifting in order to dump its contents in the sewer underground. The availability in three sizes, maxing at 39 gallons, allows you to use your toilet for days, without the need to do any immediate emptying. It has a tough construction with its polypropylene material and is less expensive than the Barker 4-wheel tote. This product is a good alternative provided you will be towing it on even surfaces. Its pipe is translucent that lets you know when the tank is filled up. The 4-Wheel Tote-N-Stor boasts of a longer three-year warranty, enough to allay any fears of this product not working accordingly. This tank is a cheaper option for good reason, it has quality issues that you wouldn’t find in the Barker tank. It uses hard rubber albeit very narrow wheels, that will be a challenge to drag on mud surfaces or any rugged terrain. Some have even claimed their structure to be weak because they easily break after a few uses. Ultimately, if you want a truly heavy-duty portable tank that will last many years, you really should shell out the extra bucks and get the best of them all, which is the Barker 4-Wheel Tote-Along. You can lug it on rough terrain with ease, without having to feel its bulky weight. Just attach to the fittings and it will do its job without requiring anything more from you. When you buy any portable holding tank, a hose of up to five feet long is a default accessory. However, you will find that its quality is just not up to par. That is why I would suggest buying another one such as the RhinoFLEX Tote Tank Sewer Hose. This type of hose is collapsible with a ninety-degree elbow that allows easy transmission of your toilet waste into the portable tank. This part is translucent, which will indicate when everything has been emptied out. Now that I have announced my top choices and totally recommend to get the Barker four-wheel device, you should still determine which one to buy according to different factors. How long your trip will determine the gallon capacity of the portable holding tank you will need. Simply put, if you plan to camp out for long, then you will definitely want a bigger tank that can hold more before it has to be emptied out. You are already aware of the many sizes each portable holding tank has; going with the biggest capacity is always a safe choice. And needless to say, it is a better option for those who plan on longer trips. I have stressed the clear advantages of four wheels over two wheels. So if you are looking for comfort and hassle-free handling, go with the four-wheeled tank. The two-wheeled version becomes an option only if you are conscious of the price since it is cheaper than the four-wheeled unit. The last thing you would want to happen is for your waste tank to have leaks. This is not only disgusting but can also be hazardous to one’s health. You should consider buying portable tanks made of durable plastic materials such as polyethylene and polypropylene to ensure their integrity and lifespan. This is a solid plastic material that is lightweight and can hold its contents securely in cold temperatures during winter. This feature makes it a preferred material on portable waste tanks. It suits any type of RV and has been proven to last a long time. As durable as the polyethylene, a portable holding tank made from polypropylene is also able to work with different types of weather. This material is non-toxic and reliably stable. The portable tank will not only contend with its heavy contents but also, it can work efficiently despite varying temperatures. Often, it has to be outside so you have to get something tough and rugged that will last long such as a tank made from this material. The all-important consideration as with any purchase is the price. Buyers always want more value for their hard-earned money so they would usually get something cheaper, thinking it’s enough to do the task. While there are products that are cheap yet have good quality features, it’s quite different with portable holding tanks. The premium models come with a price tag but are surely worth the investment. There’s more to learn about handling your RV waste tanks so I won’t be sparing you the gory details any longer. So you won’t be dragging your portable tank unit all the time. Whether it’s a four-wheeled tank or just the one with two wheels, you will probably need to lift them at some point by placing them, and all of its fifty-pounds heavy load onto your truck or any higher surface. What to do? Well, there’s the Rack Jack to assist you with that. The Rack Jack is not only specific to lifting your nice portable holding tank, but also any heavy load such as a generator or a filled carton box. It is a mounted hoist that enables you to lift, load and maneuver any large items on your vehicle by yourself. The Swivelift feature allows your load to be positioned on the shelf that is included with the Rack Jack package. This way, you don’t need the crisscrossing straps to secure your item when lifting it. A portable holding tank is a must-have in any RV adventurist arsenal. This avoids the unpleasant task of manually taking out your black and grey tanks to dump their contents. With wheels that aid in towing to the sewer station, the portable holding tank can be easily connected to the hitch ball of your trailer. You can also load it on the back of your pickup truck for emptying at the sewer. In this application, however, you must take note that you won’t be able to drive at 50mph because it should be towed slowly. When you get to the sewer location, you will have to do some heavy lifting if you have a two-wheel tank, or if you will take out your portable tank from your truck’s rear compartment. A liquid gallon would be equivalent to more than eight pounds. So if you have a small-sized holding tank that’s full at 15 gallons, that means you will have to practically lift a normal-size adult weighing 120 pounds all the way to the spot. The most feared item about portable waste management is the black tank. While it can be truly disgusting, you just have to know how to deal with them. Afterward, you will realize that it’s not so bad as you fear it would be. Grey tanks are called as such because they hold grey water. This is wastewater resulting from use in the bath, kitchen sink, among others. Although it is obviously unclean water, it is good enough to be reused, like lawn maintenance for example. An average-sized RV has one grey tank while the bigger ones such as 5th wheelers and longer trailers would usually have two. The setup will be the latter if your kitchen and bathroom are further apart. This will entail more work because you will be draining not one but two grey tanks. On the other hand, a black tank contains human waste passed on from the toilet. Unfortunately, it is not uncommon for waste spillage to happen, which can be any RVer’s nightmare. A black tank clogs more frequently given the solid waste material that goes into it. Using the wrong kind of toilet paper makes matters even worse. It is also a habit of some RV owners to dump the black water too often. While this may be initially thought of as a good, hygienic practice, on the contrary, it leads to more solid waste build up inside. When you empty your black tank at the right time, meaning, it’s at full capacity, more waste will be disposed of. This is because there is more water to wash down the waste. Otherwise, your waste just gets stuck inside and messing with the sensors, which cause them to provide inaccurate readings. Nonetheless, there are chemical treatments that can address these tank issues to keep everything working in order. However, you should still handle the dumping more efficiently by flushing out your black tank first, followed by the gray tank. This way, the grey water will somehow wash down any residue in the sewer hose. When your trailer is attached to a sewer at your camping site, your valve must remain closed until it’s time for you to unload. In fact, it is imperative not to leave it open because the liquids will flush out freely while the solid waste just gets stuck, and clog your mechanism as a result. On the other hand, you can you leave your valve for your grey water tank open while connected to a sewer. This is acceptable, just not the valve for your black tank. While such devices are helpful in providing us with necessary info, more often than not, these sensors are not as reliable when they refer to your black tank. The ones for your grey tank should be pretty accurate though unless you are not strict with preventing any solid particle to come through. This might also happen with soap buildup. But if everything functions accordingly, then you can trust your sensor readings without a doubt. Offhand, it’s quite easy to determine even without sensors if your grey tank is already full. If the water from your shower does not come down easily, then the tank has been maxed. And if you choose to ignore this, you may have grey water overflowing back upwards, providing you with a cesspool in your bath. Going back to your black tank, with mostly solids going into it, not to mention toilet paper, it can definitely mess with your tank sensor and provide you with an incorrect reading. Struvites are cement-like crystals that form from released gases of decomposing sewage. They commonly inhabit RV tanks and can cause all sorts of problems. One is to cause sensor failure and second is, they trap odor-causing bacteria. Good thing they can be solved with the right cleaning materials such as a probiotic tank treatment, which prevents their formation and foul smell. So, while sensors can be helpful, use your experience and common sense when dealing with clogged tanks. After all, for as long as you know the size of your tank, you will already be aware of how much it can hold, and for how long. Before you get to the point of your toilet flush failing on you, observe proper care and maintenance to proceed without issue. There are many cleaning agents out there, and mind you, it can be pretty overwhelming when you go to your hardware store and see multiple options on the rack. TankTechsRX holding tank treatment is said to be a good cleaning solution in avoiding tank sensor failure. It is a probiotic liquid that converts waste into liquid form and eliminates foul odors at the same time. You can check this one out because it is quite affordable as well. We have already talked about the portable holding tank where you can dump the contents of your black and grey tanks into. This holding tank is a savior, especially if you don’t like to break your camping stay by driving your rig to a dump station, which may be far from your location. A portable holding tank can house your black and grey water for days, enough to finish your camping trip without interruption. Alternatively, you can also dump your solid and liquid waste at any campsite where there is a sewer you can hook up to. If not, you can bring your rig to a dedicated dump station. Always make sure to dump only when your black tank is nearly full in order to dispose of its contents more efficiently. A heavy load will create enough force to weigh down everything inside compared to a lighter load. With enough liquid, you should be able to empty it out completely. There will be instances when you will encounter camping areas that have no sewer on site. As such, it could be a potentially messy affair because you have to bring everything with you, waste and all. Not only is this entailing more work from you, but it also can be very stressful to agonize over. And even if you choose to temporarily leave your camp to dump your dirty business, it’s possible that you will no longer be able to reclaim your spot, because another camper has already parked in your slot. A portable holding tank then becomes a crucial component of an RV toilet. These two indispensable items help make camping a fun activity instead of skipping the experience just because you don’t want to deal with nature’s call when you’re out in the wilderness. It also keeps your RV black and grey tanks less odorous and safer to maintain a hygienic trailer environment. Needless to say, you should also get a portable holding tank that is bigger than the black and grey tanks of your rig, otherwise, you are defeating its purpose of unloading your waste safely and efficiently. Even if you have extended the comforts of your home to your RV, you must remember that the toilet in your trailer is different from your house toilet. Without the usual toilet tank, you must do two steps in flushing. One is to push the lever or handle halfway through to refill the toilet bowl with water. Second is, to press all the way down to flush your waste completely. Avoid throwing any sort of trash in your RV toilet because it can come back to haunt you quite literally. A clogged tank is some of nastiest situations you will deal with. It can be solved for sure, but why would you risk getting to that point when you can observe proper measures to prevent it from happening. And always wear your gloves whenever you touch the tank itself, and its fittings. Don’t just empty your tanks on any camping ground thinking it’s ok because it’s a natural thing to do. Blackwater is gross for a reason – they are full of bacteria which can make anyone who will come into contact with it sick. And, when it comes to grey water, you should also dispose of it at the appropriate facilities such as a sewer station. Use appropriate cleaning liquids for your tank maintenance. This will reduce odors and further break down any sticky residue inside. You can even use a dishwashing liquid for this purpose. However, you should never use windshield fluid to flush your toilet during winter time. This will wear off the sealants in your tank, which will lead to a nightmare-inducing scenario of waste leakage. While you can use flushable toilet paper when you do your business in your RV toilet, it’s best not to throw it down the toilet like you would with your home toilet. Just use a lined trash can with a lid. This way, your black tank will less likely clog and save more room, so you can maximize your camping days without the trouble of having the need to dump a full black tank during your stay. No matter how seemingly revolting the task of waste management is, somebody’s gotta do it, and that somebody is none other than you as a responsible RV owner. As we have discussed, a portable waste tank makes a rather difficult process a much easier one when it comes to taking care of your RV “business”. Once you’ve gotten the hang of its use, you will find more fun and enjoyment in your RV escapades. And I could not stress the importance of getting a good quality tank any further, such as our top pick the Barker 4-wheel tote. You’ll be glad to follow my advice.